Jah Prince spins Caribbean, African and American music every 2nd Saturdays & 3rd Fridays monthly at the Vibes Night Club in Decatur, GA. He also is the DJ for Art on the Wall, every other Thursday in downtown Atlanta, and this is “not your average art show”. Listen weekly on www.DaFlavaRadio.com for the ‘Sunsplash Mix Show’ Saturday Mornings from 10:00am to 1:00pm (Eastern). 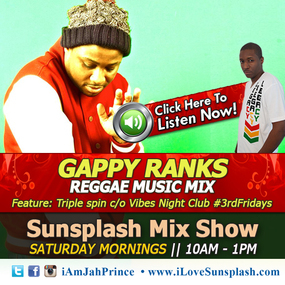 This show is also heard in the streets of Gambia on Vibes FM 106.1 and on Radio 971 in Dubai (UAE). 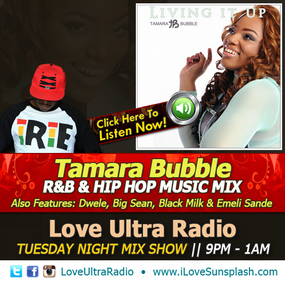 DJ Jah Prince also is the host of ‘Love Ultra Radio’, a R&B mix show, Tuesday nights from 9:00pm to 1:00am on www.DaFlavaRadio.com (Eastern). This show is also heard in the streets of Gambia on Vibes FM 106.1 and now Radio971 in the streets of Dubai (UAE). Ball ft Lil Wayne – T.I. 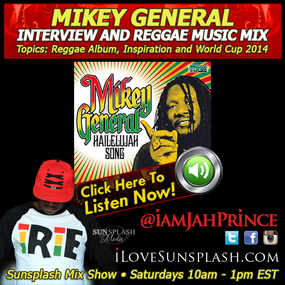 On this weeks syndicated radio program we speak with reggae singer Mikey General. Representing many aspects of the reggae genre, Mikey sings rub a dub and culture on this new album HaileluJah Song . Talking live about a few key cuts recorded in Spain and also at Tuff Gong Studios in Jamaica via the ReggaeLand label. 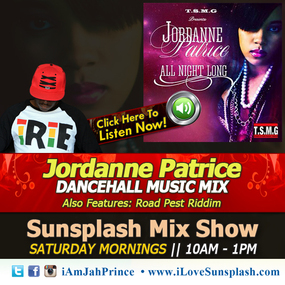 We then talk about the impact of reggae on several countries in Europe, the love songs that connect with his audience and even who he thinks will take the crown for World Cup 2014. Phife releases his new single ‘#dearDilla’ on Smokin’ Needles Records. #dearDilla is an open letter to his long time friend and producer, the legendary J Dilla (James Dewitt Yancey), who passed away on 2006 from complications from a rare blood disorder. With a soundscape created by DJ Rasta Root, Phife talks to Dilla about the current state of music and how much he and his work are missed. The visual for #deardilla will have a premier in Atlanta on Feb. 6th at the Midtown Art Cinema (7:30-9:30pm) with a Q & A. Then also premiered at Dilla Day in Detroit on Feb. 7th. Jah Prince spins Caribbean, African and American music every 2nd Saturdays & 3rd Fridays monthly at the Vibes Night Club in Decatur, GA. He also is the DJ for Art on the Wall, every other Thursday at HOBI – and this is “not your average art show” at the House of Blended Ink Studios & Gallery in downtown Atlanta. 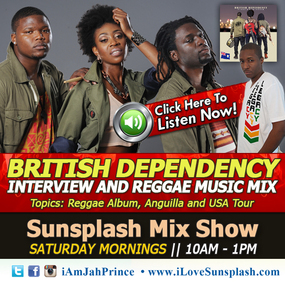 On this weeks syndicated radio program we speak with the roots reggae band British Dependency. Representing Anguilla and featured as the opening act during The Wailers Legend 30th Year Tour we catch up with this trio of talented musicians. Now the jokes about Ruel, Joyah and Jaiden mainly focus on their age and how the sound of their current album ‘Finding Wisdom’ might be surprising to patrons. They dazzled the audience in Atlanta, Georgia and i’m sure they’ve gotten the same reaction as more people will learn. Listen to find out who is really hitting those drums, who’s voice the ladies love and why they can’t keep their eyes off this group as they move up the east coast and up the iTunes charts! #WeSalute Victor E. Lewis (VICRAE Inc.), Stacey Bethel (Triple The Focus), Miss Natalie Bloom and the Sunsplash Media Team (Networking Caribbean Culture Worldwide).